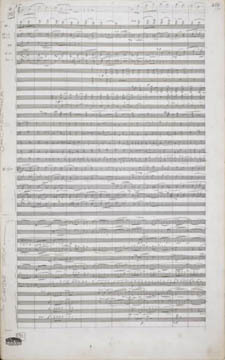 Scroll down the timeline to follow the development of this twentieth-century masterpiece. Click on a topic for more information. 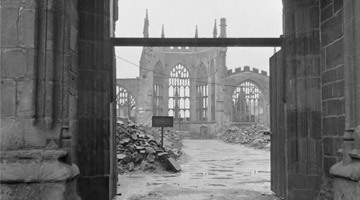 The medieval cathedral in Coventry was destroyed by the Luftwaffe in overnight bombings that devastated the city. The decision to rebuild the cathedral was taken the morning after its destruction, not as an ‘act of defiance, but rather a sign of faith, trust and hope for the future of the world.’ Still image courtesy of the Trustees of the Imperial War Museum, London (Crown copyright). 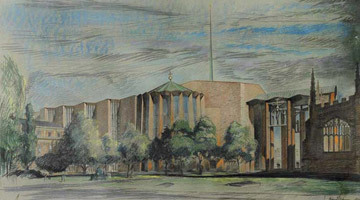 A competition to design a new cathedral for Coventry was won by Basil Spence (1907-1976). 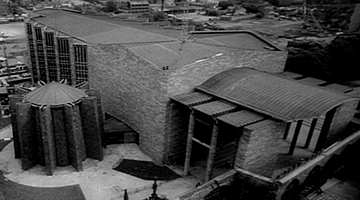 Building work began in 1956 and was completed in time for the consecration festival in May 1962. 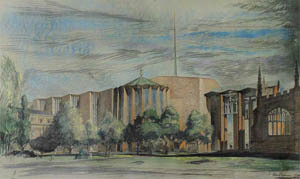 Spence was knighted for his work on the building in 1960. 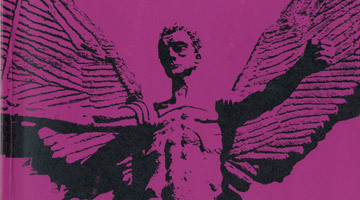 Image courtesy of the Basil Spence Archive, Royal Commission on Ancient and Historical Monuments Scotland. 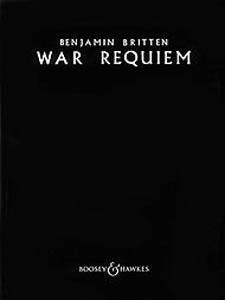 Early in planning War Requiem Britten copied out the Latin text of the Requiem mass in an old school notebook, interspersed with the Wilfred Owen poems he planned to weave into the piece. 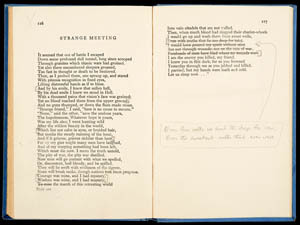 His source for the Owen poems was Edward Blunden’s edition of The Poems of Wilfred Owen, reprinted in 1955. 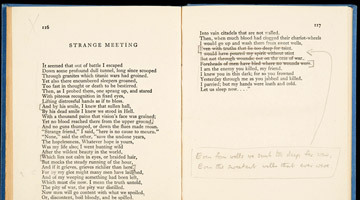 Britten’s copy includes some pencil annotations and cuts to the selected poems. 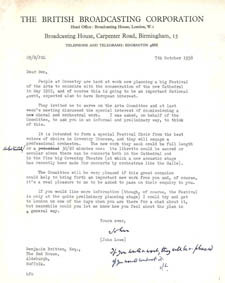 By February 1961 Britten was already thinking about the performers he wanted to take part in the new work. 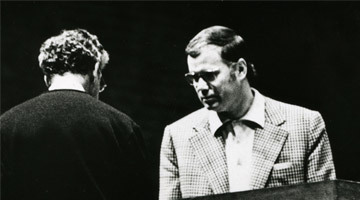 He asked John Lowe to engage the Melos Ensemble as the chamber orchestra. 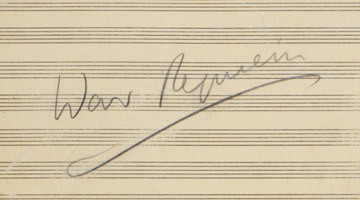 On 16 February Britten wrote to the German Dietrich Fischer-Dieskau to ask him to perform the baritone role at the work’s premiere: ‘I am writing what I think will be one of my most important works. 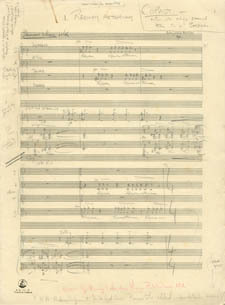 It is a full-scale Requiem Mass for chorus and orchestra (in memory of those of all nations who died in the last war), and I am interspersing the Latin text with many poems of a great English poet, Wilfred Owen, who was killed in the First World War … These poems will be set for tenor and baritone, with an accompaniment of chamber orchestra, placed in the middle of the other forces. They will need singing with the utmost beauty, intensity and sincerity … and with great temerity I am asking you whether you would sing the baritone.’ Fischer-Dieskau accepted. 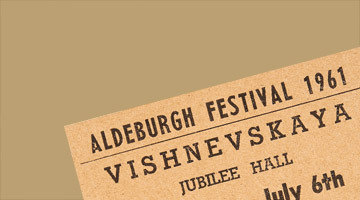 The 1961 Aldeburgh Festival saw the premiere of the Cello Sonata that Britten had written for the Russian Mstislav Rostropovich. Accompanying the cellist was his wife, the soprano Galina Vishnevskaya who – in a late addition to the Festival programme – gave a recital in the Jubilee Hall. 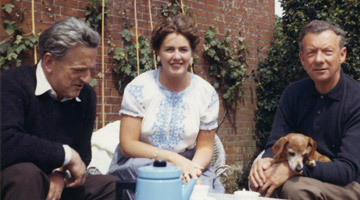 She later recalled: 'After the concert Britten came up to me, showered me with compliments, and said he was particularly glad to have heard me right at that moment because he had begun to write his War Requiem and now wanted to write a part for me.' 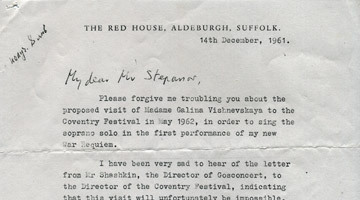 In August, Britten wrote to the Soviet Minister of Culture to ask if Vishnevskaya could participate in the premiere. 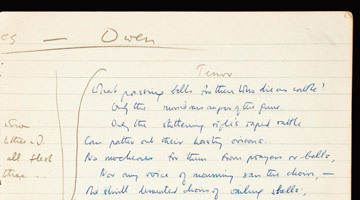 Over the course of 1961 formal arrangements were made with Wilfred Owen’s publishers to use the poet’s works in the Requiem. 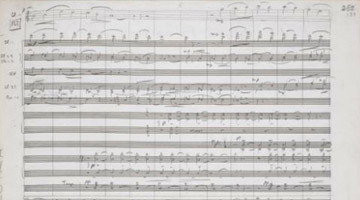 In September a contract was signed between Britten, his publishers, Boosey & Hawkes, and Owen’s publishers, Chatto and Windus. 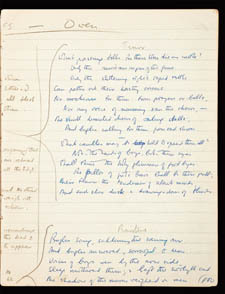 Image: Britten’s annotated copy of The Poems of Wilfred Owen, edited by Edmund Blunden. London: Chatto and Windus, 1955. Photo: Nigel Luckhurst. 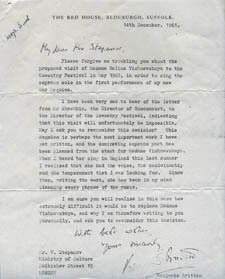 By October, Britten had settle on the title War Requiem, and asked for it to be known as such in the Coventry Festival brochure. 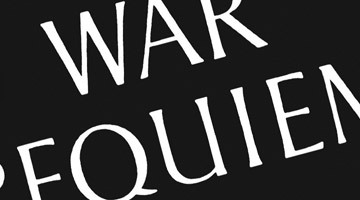 In correspondence he had previously referred to the work simply as the ‘Requiem Mass’. 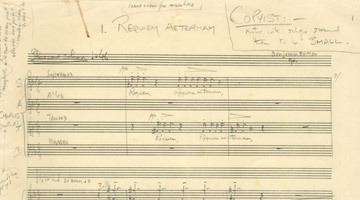 As Britten completed each section of the War Requiem vocal scores for the singers to rehearse with were prepared by Britten’s assistant, Imogen Holst. 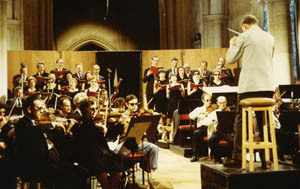 Some rehearsals of early sections had already taken place before the work had been completed. 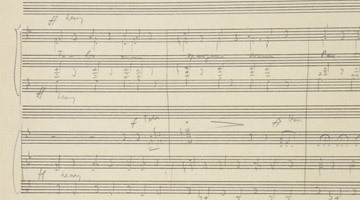 Image: Manuscript vocal score (detail). 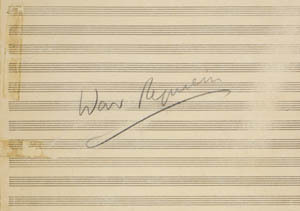 Benjamin Britten, War Requiem, Op. 66. 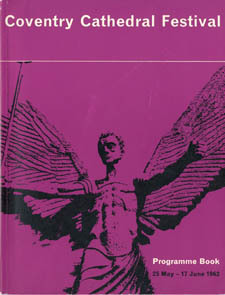 © Copyright 1961 by Boosey & Hawkes Music Publishers Ltd. Reproduced by kind permission of Boosey & Hawkes Music Publishers Ltd.
Over the early months of 1962 Coventry's ‘Festival Chorus’ regularly rehearsed the work. Members of the London-based Ambrosian Singers were drafted in to help the chorus, which was struggling with the complexities of the score. 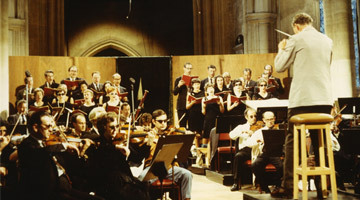 Image: Britten conducting the Ambrosian Singers and English Chamber Orchestra in rehearsal, 1967. Negotiations for Vishnevskaya’s participation continued with the Soviet Ministry of Culture, but permission was ultimately denied. The soprano, who had been in London performing in Aida, was made to fly home. 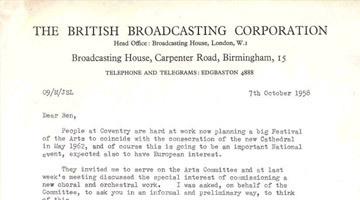 She was ordered to tell reporters that she was due home for a television appearance, but the real reason was that the Soviet authorities objected to the German money used to build the new Coventry Cathedral. Heather Harper agreed to take the soprano part with 10 days’ notice. 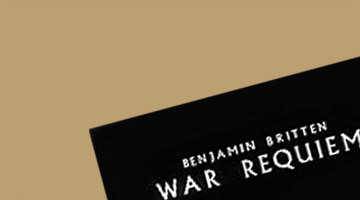 The iconic black and white artwork that made such an impact on Decca's War Requiem LP in fact originated from Britten's music publisher, Boosey & Hawkes, who designed it for the cover of the published score.